Your defeat of Xanthir Vang and the Templars of the Ivory Labyrinth uncovered the secrets of Nahyndrian crystals. Now the Crusader Queen Galfrey has asked you to travel through an Abyssal Rift so you can find and destroy the source of the demons' mythic power. The Pathfinder Adventure Card Game: The Midnight Isles Adventure Deck is a 110-card expansion that adds new location, monsters, villains, and more to the Pathfinder Adventure Card Game. This deck also includes rare loot cards and 5 new scenarios that make up the complete The Midnight Isles adventure. 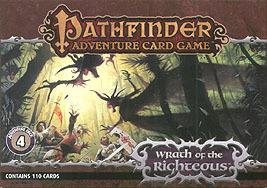 Continue your character's mythic ascension with the Pathfinder Adventure Card Game: The Midnight Isles Adventure Deck.